The amount of EGI Bratislava Laboratory staff varies from year to year, spanning between fourteen and twenty. It consists of three to four EGI employees and about four MS and PhD students attached to the Laboratory via external post-graduate programs administered at the Masaryk University in Brno, Czech Republic. As well as eight to twelve students from the Comenius University in Bratislava, Slovak Republic, working as research assistants. Following the EGI mission “The science to find energy”, the Bratislava Laboratory specializes on rifts and passive margins, their development mechanisms and controlling factors, their thermal histories and petroleum systems. Its key strengths are structural geology and geochemistry. The last five years have been devoted to the structural architecture of transform margins, their thermal regimes and petroleum systems. The role of the EGI Bratislava Laboratory in the EGI organization can be found at: www.egi.utah.edu. The Bratislava Laboratory provides hands-on training for future researchers and exploration geologists in the fields of structural geology and geochemistry. As such, it also provides a long-term education program for the future employees of the Geological Institute of the Slovak Academy of Sciences. Apart from that, first year students in the Laboratory learn the Arc GIS program devoted to the development of robust databases and their visualization, together with other programs geared toward a development of data tables and figures for reports and articles. The next two years of training are devoted to mastering Arc GIS and fluency in reflection seismic interpretation in Petrel. Students on a geochemical track focus on proficiency with PetroMod thermal and maturation history modeling. In their third year, students run their own sub-projects in research programs run by the Laboratory and present their results to the sponsors of respective programs. This is also the year when they learn how to write scientific articles together with principal investigators from the Laboratory. 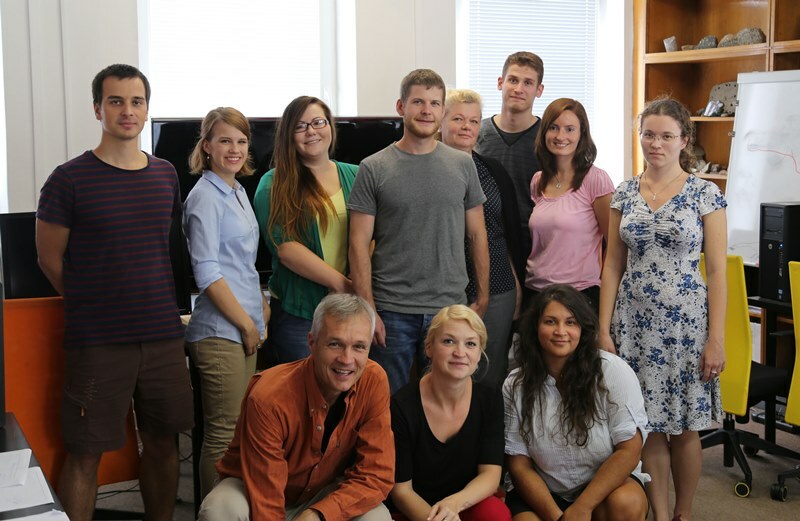 As a weekly routine, the Bratislava Laboratory runs a scientific literature reading seminar that teaches students to analyze the articles and extract the information for their own scientific work. Advisors from the Laboratory actively participate in search for employment for their students once they finish training, and are ready to start their career. Train about 4 MS/PhD-level students a year, as well as providing 3-5 years of experience with doing research on projects funded by the oil industry and focused on help with exploration problems. The main focus of the Laboratory are sole-sponsored and multi-sponsored research projects, which focus either on basic science or applied research for the oil industry. Furthermore, principal advisors provide peer assists and teach short courses to CAs. Developed project reports remain confidential for 2 years to their original sponsors before they became available to the remaining EGI Corporate Members via an Online Global Database. After the 2-year confidentiality period, research projects with interesting basic research results lead to research articles, presented at scientific conferences and published in high-impact research journals specializing on Structural Geology and Geochemistry. Furthermore, the Laboratory participates in the Annual CA Technical Conference organized by EGI and the development of the Online Global Database.